Shelley Lueken took the reins as 2013 president of the Albion Chamber of Commerce during the joint chamber/Albion Development Dinner Sunday evening, Jan. 27, at the Albion Country Club. Shelley is a native of the Albion area and is employed as an insurance clerk at Boone County Health Center. 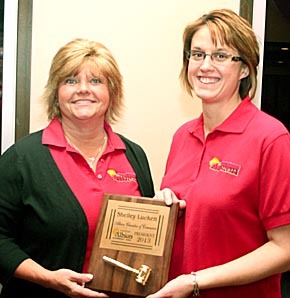 She has served three years on the chamber board. “Working with the board and membership, I hope to encourage teamwork and involvement to make the Chamber and community of Albion the best it can be,” said Lueken. Shelley and her husband, Dan, are the parents of two daughters, Lauren, nine, and Katie, five.